Get acquainted with our wines and discover your favorite. From 100% varietals to expert blends, we make serious wines that everyone can enjoy. Gain access to special events, invite-only parties, exclusive previews and limited-release products. Celebrate with us at select tastings, events and parties. Learn more about what we’re made of, and see what others are saying about us. Meet our pilot in command, Craig Becker, and learn about his process of making wines that stay true to their roots and style. "In pursuit of the finest wines, made from the best vineyards for each varietal." Our winemaker, Craig Becker, first took to the sky to make wine across California. Now he flies to selected vineyards across the state where varietal, site, climate and management are in perfect alignment. 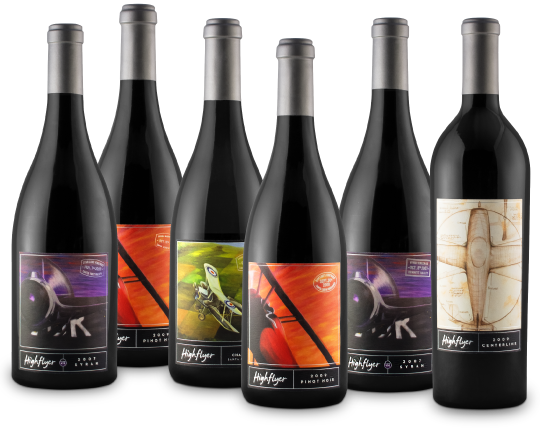 His elevated perspective allows him to stay true to each unique varietal, and sometimes artfully blend fruit from different, yet complimentary sources. The result? Seriously fun wine.